One of the coolest surprises of NYCC was running across Creatures of Delight. They were literally at the FAAAAAAAR end of the show and I almost didn’t make it there, but I’m glad I did. Now, Creatures of Delight isn’t strictly a toy. It’s more like a foam plushy. But the fabulous critters created by T. Oliver Kopian, the mind behind the Creatures of Delight, are just so neat that I couldn’t not write about them. I’d actually seen some of Mr. Kopian’s work on people’s backs or in some stores, but hadn’t realized just how varied his creations were until I ran across the booth. He makes everything from dragons to fish to plants. He even makes wall mounted items like a rhino or dinosaur head. They also come in a pretty impressive array of sizes, from something perfect for your work desk to some items that pretty much need their own end table to display. For the most part, Mr. Kopian’s work is found in specialty stores and boutiques, but if you’re dead set on picking up one of his critters (and who doesn’t need a monstrous plant for their desk?) 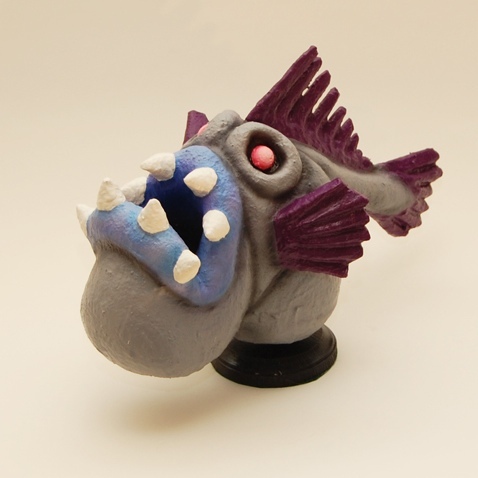 you can go direct to the artist via their web site and pick your own Creature of Delight. …And get the messenger bag for me and my laptop! Lumley here is wall mountable! Much better than a real dragon head on your wall. This particular dragon is just amazing…Definitely one of the coolest items.